Topics: Car Rental Zacatecas Airport, Zacatecas Airport Info, Car Rental Brands, Available In The Android Market, Car Rental App, and Zacatecas Airport Car Rental Companies. It has 2 DNS records, ns2.securebookingpage.com, and ns1.securebookingpage.com. It is hosted by Webnx California, using nginx web server. 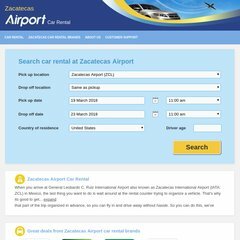 Zacatecasairportcarrental.com's IP address is 67.220.193.158. PING (67.220.193.158) 56(84) bytes of data.